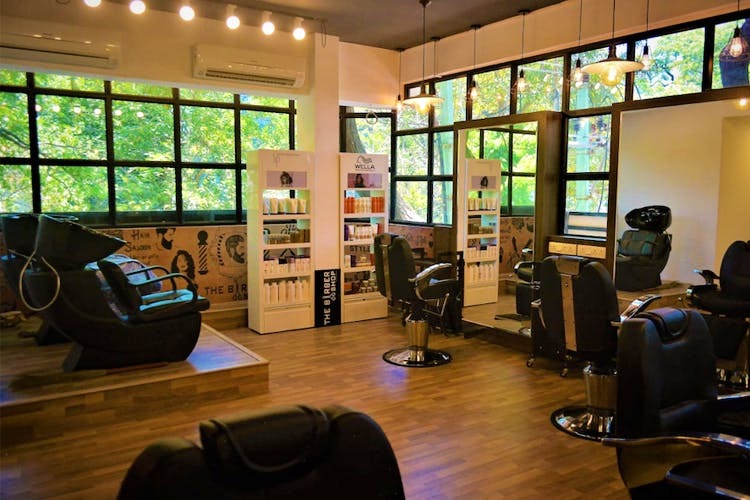 The Barber Shop on TTK Road offers moderately priced yet classy hairdressing. The Barber Shop is a mid-range Unisex salon on TTK Road that everyone's talking about. Even though they’ve only recently launched they’re quite popular, and are known for their top quality service at a fairly moderate price point, similar to salons like Limelite. Their hairdressers aren’t just hairdressers, but makeup artists and trained professionals who come with a lot of experience. So much so that they have their stream of regular clientele that follows them. Their services and treatments offered, range from haircuts and trims to waxing and oil massages on the skincare front, hair colouring as well as a bridal package service that can be customized. Furthermore, their service comes with the use of top quality products and brands like Tigi and Wella, which is great considering that it’s a moderately priced salon. One can expect to pay around INR 500 for a regular haircut. We really liked the décor of the salon itself as it’s brightly lit with plenty of glass windows overlooking TTK Road below. The overall beige colour scheme makes the salon feel quite posh, a nice touch we think. While the location is great, the fact that it’s on the busiest part of TTK Road also means that there’s limited parking space if you’ve brought a car, so do keep that in mind.